Put your faith in a service in Welling with a client happiness rating of over 96%! 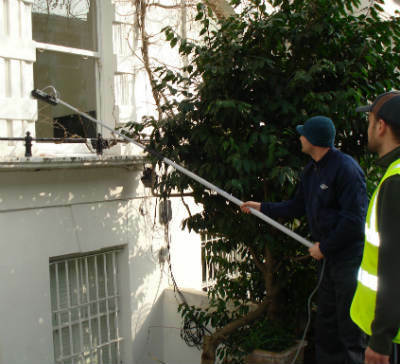 A: We can quickly remove stains with either outside window cleaning (for four-storey properties), rope access window cleaning (for tall properties), or via the usual manual cleaning of interior casements. Q: Can you tell me a bit more about your water-fed pole cleaning technique? A: Certainly! This cleaning tool can expand up to 22 metres in length, allowing the cleaners to easily reach and wash even the most distant corners of your panes. A: Our water is filtered from any residue-causing minerals. When this fluid vanishes under the sun, it won't leave any streaks behind. A: Rainwater is usually dirt-free, so it won't stop us from doing our work. However, while we won't mind a slight drizzle, a sudden downpour can bring unsatisfying results. During thunderstorms, we may have to put off our service for a day of your preference to ensure the cleaners' safety. A: No, the seasoned window cleaners in Welling can easily perform exterior window cleaning in your absence, as long as your property gates are unlocked. And if you want your windows to sparkle on the inside, just opt for our free key pick-up and delivery alternative instead. After reviewing lots of customer feedback, we've adjusted our window cleaning Welling's rates. Now, you can book our service at prices that are nothing short of competitive! For further details, please take a look at our price table below. With window cleaning in Welling, we can better the appeal of your property even if it touches the clouds above. Let's review what you'll get once you book our flexible service. For external window washing, the Welling window cleaners will utilise a expandable water-fed rod. A water pump inside the team's van will pump filtrated water up the hose and out of a brush-head attachment. The water, in unison with the brush-head, will remove any traces of filth from the casements of any four-storey premises. With rope access window cleaning, the pros will use sturdy climbing equipment to reach even the uppermost storeys in your commersial or home property. We possess all necessary COSHH documentation and risk appraisal reports and can send them to you in no time. In addition, we frequently check the cleaning gear to ensure that your appointment will go without any complications. And to wipe every interior corner of your glass surfaces, the experienced team will use the regular sponge and ladder cleaning procedure. In our goal to aid as many Londoners as humanly possible, we've broadened our window cleaning in Welling to encompass extra locations across London. For your comfort, we've included the names of these neighbouring locations below. Another quick and easy way to get a free instant quote or to book window cleaning services Welling SE9 is through our web site.